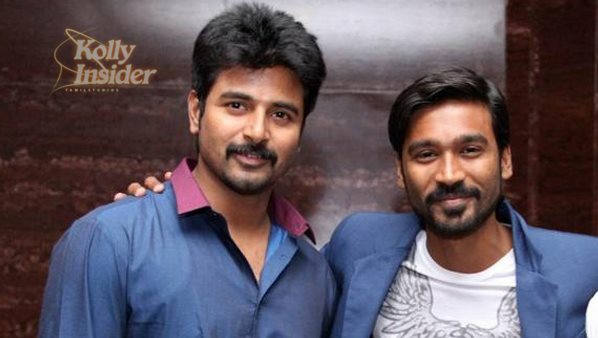 Dhanush says he and Sivakarthikeyan are happy like brothers...!! Home » Dhanush | Kakka Muttai | Siva Karthikeyan | » Dhanush says he and Sivakarthikeyan are happy like brothers...!! Sivakarthikeyan had an imperative venture in his profession with Kaaki Sattai shifting from a streamlined satire comedy actor to a more serious hero. Dhanush produced that movie and the duo share a special bonding right from 3 as we know. However, there was a news sprouting up that Sivakarthikeyan and Dhanush have some issue between them and they are not in talking terms. Sivakarthikeyan earlier clarified this during Kaaki Sattai times that everything is fine between them. Flash back... During a live Kakki Sattai promo show on a television channel Sivakarthikeyan was answering phone calls and a surprise caller turned out to be none other than the Anegan Dhanush who started by saying that Siva and him are still bonding as brothers and requested others to not talk rubbish and spoil it. Sivakarthikeyan was visibly pleased and thanked the multi lingual star for the call as it saved him from a number of embarrassing questions. Yesterday, at Kaaka Muttai audio launch event, when reporters asked about the friendship rift with Sivakarthikeyan and stage walkout on Vijay TV Super singer finale, Dhanush re-assured again that they are two happy brothers and nothing is wrong. Let us hope this baseless rumour subsides after this. Are you satisfied with Dhanush's short answer?